The Seocho (Tourist Information) Center is located at the back of Gangnam Station Exit 9, which is the center of culture, art, nature, fashion, beauty and business. Multilingual service provides tourist information, various cultural and performance information, and many other services that tourists need. 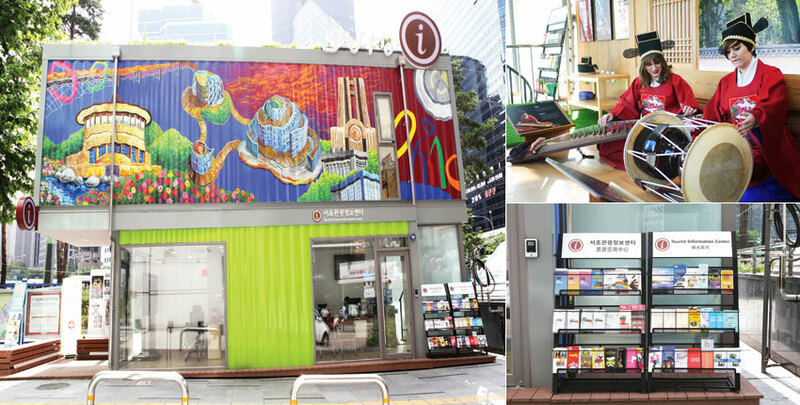 Seocho Tourist Information Center is a two-story art container that draws attention with unique paintings of the Seoul Arts Center, Sevit Island, Nue Bridge and Seocho-gu's tourist attractions. Using the characteristics of Seocho-gu with lots of cultural and artistic combinations, the first floor is equipped with a comprehensive tourist information center and the second floor operates as a Gugak(Korean Traditional Music) experience Hall. Korean, English, Japanese and Chinese-speaker are available for information desk. We offer a variety of convenient services to our customers, including luggage storage (smart box) and Internet search, tourist guide bookings and ticket bookings for Seoul Arts Center, The National Gugak Center, also National tourist information, maps and booklets are arranged. This Public Experience Hall for Korean traditional Music, You can play Korean traditional music instruments and try on royal hanbok which is korean traditional cloths. There is a photo zone and you can have a great time. If a reservation is made in advance, shared-vehicles will be provided for a specific date, time and venue. This service provides rides departing from Seocho Tourism Information Center at 10:40, and coming back from the drop-off place of Everland at 20:15 (Sun. - Thu.) and 21:15 (Fri. and Sat. ).